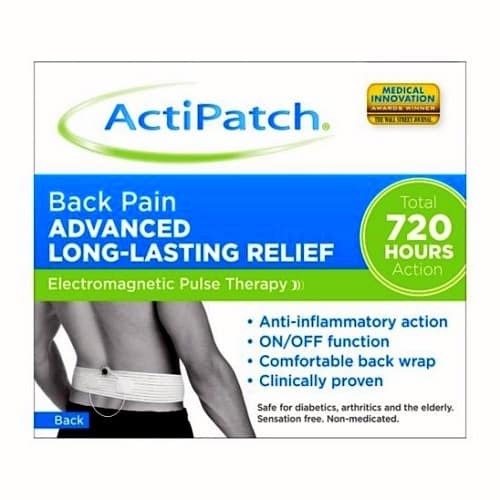 The ActiPatch Advanced Back Pain Relief product provides advanced long-lasting chronic pain relief using Electromagnetic Pulse Therapy and works great for lower back pain, backaches, arthritis, sciatica, fibromyalgia, strains, sprains and general back pain. ActiPatch drug and ingredient-free so is safe for continuous use and can be used while taking any other medication. Unlike a TENS machine, you will not feel heat or vibration. In fact, ActiPatch is completely sensation free, so the only thing you are going to feel is better. Simply place the ActiPatch device loop directly over the source of the back pain using the supplied belt or any other method you are comfortable with and wear continuously until the pain diminishes. Legal Disclaimer: Actual product packaging and materials may contain more and/or different information than what is displayed on our website. Therefore, we recommend that you always read labels, warnings, and directions before using or consuming a product. For additional information about a product, please contact the manufacturer or the seller. Content on Konga.com is for reference purposes and is not intended to substitute for advice given by a physician, pharmacist, or other licensed health-care professional. You should not use this information as self-diagnosis or for treating a health problem or disease. Contact your health-care provider immediately if you suspect that you have a medical problem. Konga.com assumes no liability for inaccuracies or misstatements about products.